Actor/humanitarian Gary Sinise has been working in support of veterans for over 30 years. His commitment started in the early 1980s when he began supporting local Vietnam veterans groups in the Chicago area and created the Vets Night program at the Steppenwolf Theatre, which he co-founded. This program continues to this day and invites veterans to a free dinner and performance for each one of the plays produced at the theatre. Among his numerous film and television roles, it was his portrayal of Lt. Dan Taylor in the landmark film Forrest Gump, in 1994, which formed an enduring connection with servicemen and women throughout the military community. Shortly after the film opened, Gary was introduced to the Disabled American Veterans organization when they invited him to their national convention to present him with their National Commanders Award for playing the double amputee. His relationship and work with the DAV in support of our wounded service members has lasted for over 20 years. After the terrorist attacks on September 11, 2001, Gary was called to action to do more to support the military men and women who were responding to those attacks. In 2003, he volunteered for the USO and began visiting our troops in Iraq and around the world. He also formed the “Lt. Dan Band” and in February 2004, began actively entertaining troops serving at home and abroad. Performing pop hits to classic rock staples, the 12-member cover band has played hundreds of shows for over half-a-million troops and their families and helped to raise millions of dollars for military charities across the country. In 2004, he co-founded, with author Laura Hillenbrand, Operation Iraqi Children, a program designed to “Help Soldiers Help Children” by shipping hundreds of thousands of school supply kits to troops serving in Iraq. The program evolved into Operation International Children as they began shipping to Afghanistan and other conflict areas where U.S. troops were deployed. In recognition of his humanitarian work on behalf of our nation’s defenders, Sinise has earned many distinguished awards including the Bob Hope Award for Excellence in Entertainment from the Medal of Honor Society, the Spirit of the USO Award, the Ellis Island Medal of Honor, the Doughboy Award, the Sylvanus Thayer Award, and the Dwight D. Eisenhower Award from the National Defense Industrial Association. In 2008, he received the Presidential Citizens Medal, the second-highest civilian honor awarded to citizens for exemplary deeds performed in service of the nation. 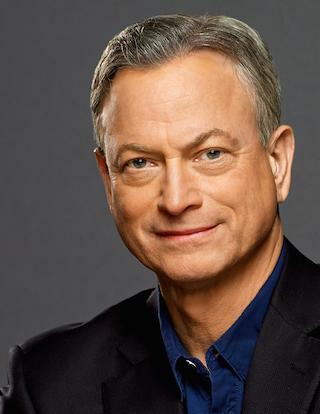 In 2012, Sinise was presented with the Spirit of Hope Award by the Department of Defense, was named an honorary Chief Petty Officer by the United States Navy and in 2013 was pinned as an honorary Marine by General James Amos, Commandant of the United States Marine Corps. For a more detailed look at appearances and honors go to www.garysinisefoundation.org/letter-gary. Gary Sinise Foundation was formed in 2011 with the mission to honor America’s defenders, veterans, first responders, their families and those in need. Through its R.I.S.E. (Restoring Independence Supporting Empowerment) program, specially adapted smart homes are being constructed for severely wounded veterans nationwide. Each one-of-a-kind home is customized to ease the everyday burdens of a wounded hero, their family and caregivers. Other programs include Relief & Resiliency Outreach, Invincible Spirit Festivals, the Lt. Dan Band, Arts & Entertainment Outreach, Serving Heroes, and First Responders Outreach. Its latest program, Soaring Valor, is sending WWII veterans to The National WWII Museum and documenting their first-hand accounts of the war. For more information, please visit GarySiniseFoundation.org.